HOUSTON -- J.J. Watt did it again. His home crowd showered him with chants of "M-V-P," after a strip sack, fumble recovery and 14-yard return, but the Houston Texans defensive end wasn't finished. Two plays later, Watt did what has become normal for him. He caught a 1-yard touchdown pass from Texans quarterback Ryan Fitzpatrick, giving the Texans a 45-14 lead over the Tennessee Titans. It was the sixth touchdown pass Fitzpatrick had thrown in the game, setting a franchise record. 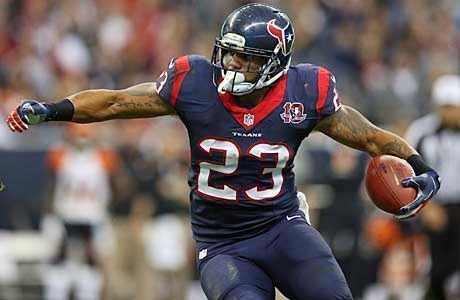 The Texans won Sunday's game against the Titans 45-21. Fitzpatrick also threw for a career-best 358 yards in his first start after being benched the past two games for Ryan Mallett, who suffered a season-ending chest injury last week. Watt is now the first defensive lineman since 1944 to have at least five touchdowns in a season. According to the Elias Sports Bureau, Watt is the first player with three offensive touchdowns and two defensive scores in a single season -- regardless of position since 1948, when Joe Golding had four touchdown receptions and two interception return scores. "Never ever, ever, ever becomes old hat," Watt said of scoring touchdowns. "It is a blast. I mean, just to hear the stadium, to see my teammates. Like I said after my first one, there's no greater feeling than scoring a touchdown and seeing your teammates come running over to congratulate you. I mean, those guys got the ball down there. It's the best feeling in the entire world." According to ESPN Stats & Info, this is Watt's second game in the past three weeks with a forced fumble, fumble recovery and receiving TD. No other player in the past five seasons has one such game. Watt had three tackles, two sacks, one tackle for loss, six quarterback hits, a forced fumble, fumble recovery and a receiving touchdown against the Titans. He now has 11.5 sacks this season and five fumble recoveries. In addition to three offensive touchdowns, Watt has caught an interception that he returned for a touchdown and recovered a fumble that he returned for a touchdown.